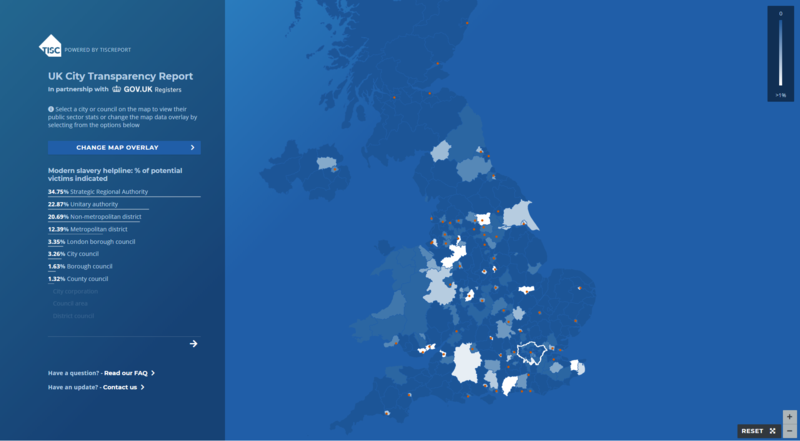 TISCreport’s live UK transparency Map now shows slavery and labour exploitation hotspots across the UK using real information derived from the Modern Slavery Helpline. This is overlaid on the cities, counties, districts and boroughs supplier compliance data. At the beginning of Anti-Slavery Month (October 2018) TISCreport published the UK’s first live Transparency Map online. This easy to use tool showcased the potential power that has until recently lain dormant within the UK’s local government procurement budgets. In short their system allowed all public bodies to quickly check their suppliers in terms of compliance with the modern slavery act, thus to be fully informed when choosing where and with whom to spend public funds. This means that without expending any extra taxpayers money, simply by being intelligently selective about public spending, Councils can help drive out slavery and exploitation. What’s more, in addition to checking their own Councils spending all members of the public can now also clearly see what proportion of calls to the UK Modern Slavery Helpline are originating from their local areas (cities, counties, districts and boroughs), and how that translates to the proportion of potential victims. This pinpoint transparency will further assist public services to coordinate and target their resources by looking closely at each hotspot. "It is horrible to think some of the goods and services we buy could have been produced by someone forced into modern slavery. This is abhorrent and as global leaders in the fight against modern slavery, we will not tolerate it. Anyone can see how their city is faring on public sector supply chain transparency by clicking on their city or district on https://tiscreport.org/public-sector/uk-transparency-report/. 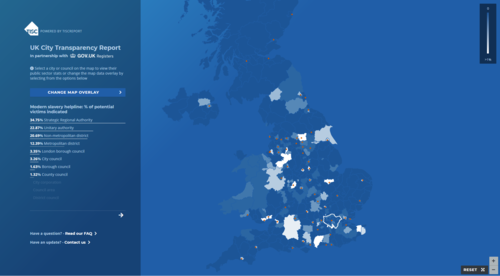 Rather than being a static snapshot, many other live transparency data sets will be added to this map, making it the best available picture of transparency of cities in the UK, using unique data sets that are not held anywhere else. The TISCreport platform enables all ethical buyers across all sectors to quickly check their supply chains for available corporate transparency data. By uploading their suppliers from their systems, public sector buyers can maintain the transparency of their supply chains, and they can check modern slavery act compliance all at zero cost to the taxpayer. *TISCreport is the UK’s only Transparency in Supply Chains register, built to UK Government Digital Service specifications using UK Government digital infrastructure. In accordance with section 54 of the UK Modern Slavery Act TISCreport tracks websites of all those companies and groups known by the system to be over £36M in turnover as well as recording voluntary compliance from organisations below the threshold. The TISCreport dynamic dataset is continually being updated, and there are just under 1000 UK public bodies within the system. It is a certified open data provider, free to join, enabling an in-depth drill down of data against shared supply chains via a private, secure dashboard. Uniquely, beyond the UK, TISCreport interlocks intelligently with related global legislations focussing on supply chain transparency and tackling modern slavery/labour exploitation. More transparency data sets are in the pipeline which will enable cities, districts and boroughs to hone in on labour exploitation within their supply chains. As a B-Corp social enterprise, TISCreport funds itself through subscription fees from organisations able to afford the £200 annual subscription fee and transparency data services. 50% of the subscription fee goes directly to anti-slavery charity Unseen, which runs the UK Anti-Slavery Helpline. All fully paid memberships subscribed before 3rd December 2018 will enable TISCreport donations to be matched via The Big Give. There is no risk to ongoing investigations or victims as the helpline data held on TISCreport is anonymised and redacted. For further information or to arrange an interview please contact Jaya Chakrabarti at TISCreport.org. This press release was distributed by ResponseSource Press Release Wire on behalf of Tiscreport in the following categories: Business & Finance, Education & Human Resources, Public Sector, Third Sector & Legal, for more information visit https://pressreleasewire.responsesource.com/about.